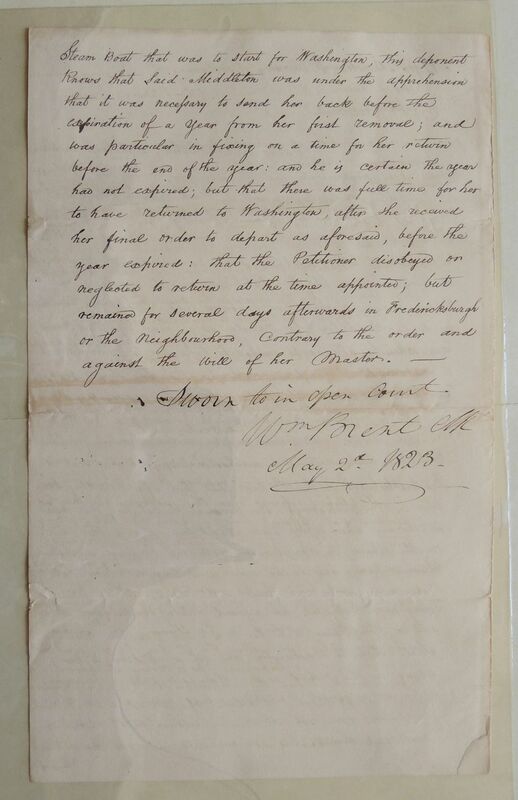 Walter H. Middleton, a witness in the above cause, makes oath that the Petitioner was given to Henry O. Middleton whilst he resided in Washington or George Town several years ago, by the Father of his Wife, Francis Tolson, of Prince Georges: That she lived with said Henry O. Middleton, as his servant till May 1820, when he removed to Fredericksburgh in Virginia, and left the Petitioner at Mr. Callis's in Prince Georges: That the Petitioner had always been treated by said Middleton & his Family as a most indulged Servant, and when he afterwards wished to take her to Fredericksburgh it was made a Condition with her that she should go, and see how she liked her change of situation, and if she should not like it on trial, that she might return and live with her old Master Mr. Tolson, or get another master in the District: that with this understanding she was sent to Fredericksburgh on the 7th Decr. 1820. That after residing some time in Fredericksburgh she became dissatisfied, and wished to return; upon which said Middleton agreed that she might return, in compliance with the original understanding between them; and as she was unwilling to return to Prince Georges to her old Master Mr. Tolson, but preferred living in the District, he agreed out of indulgence to her and in compliance with her own wishes & request that she should return to Washington and get a Master to her liking in the District or in Maryland: that in pursuance of this arrangement & understanding between then said Middleton some time about the last of Novr. or first of Decr. 1821 directed her immediately to go on board the Steam Steam Boat that was to start for Washington, this deponent knows that said Middleton was under the apprehension that it was necessary to send her back before the expiration of a year from her first removal; and was particular in fixing on a time for her return before the end of the year: and he is certain the year had not expired; but that there was full time for her to have returned to Washington, after she received her final order to depart as aforesaid, before the year expired: that the Petitioner disobeyed or neglected to return at the time appointed; but remained for several days afterwards in Fredericksburgh or the neighbourhood, contrary to the order and against the will of her Master. Sworn to in open Court. 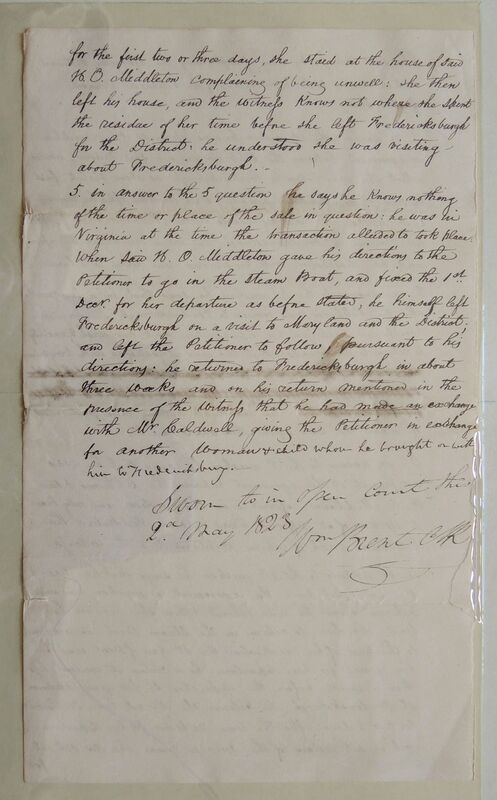 1. in answer to the 1st question he was informed of the condition or agreement between the Petitioner and her said Master, under which she was taken to Fredericksburgh as above stated, first by said H. O. Middleton himself, some months after he removed to Fredericksburgh: and afterwards by the Petitioner herself, after her removal to Fredericksburgh, and when she began to complain and be dissatisfied with her situation and desire to return. 2. in answer to the 2d question he says that, in a few months after the Petitioner was removed to Fredericksburgh, she frequently complained & expressed her dissatisfaction and her wish & anxiety to return to her friends: that she was dissatisfied with Virginia: [strikethrough] he recollects nothing more particular of what she said upon that subject. 3. 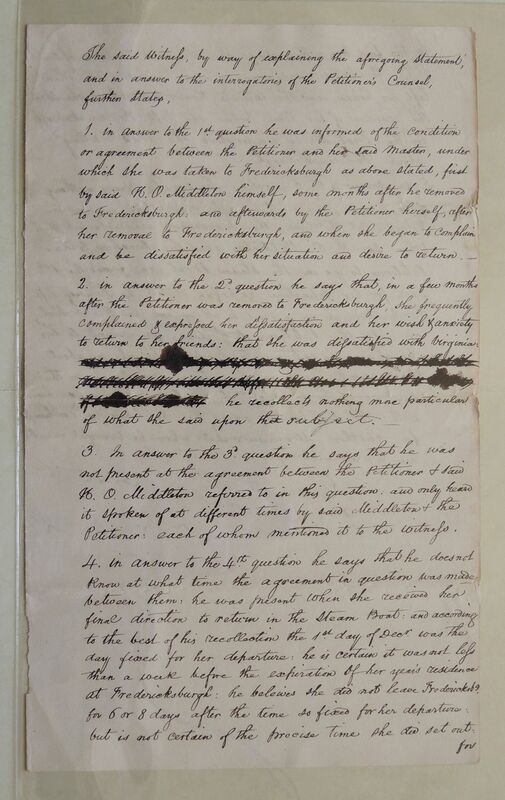 In answer to the 3d question he says that he was not present at the agreement between the Petitioner & said H. O. Middleton referred to in this question: and only heard it spoken of at different times by said Middleton & the Petitioner: each of whom mentioned it to the witness. 4. in answer to the 4th question he says that he does not know at what time the agreement in question was made between them: he was present when she received her final direction to return in the Steam Boat: and according to the best of his recollection the 1st day of Decr. 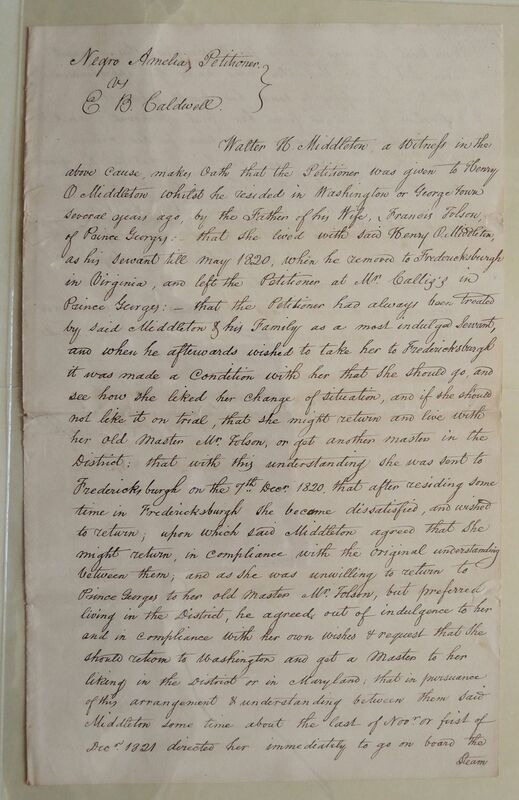 was the day fixed for her departure: he is certain it was not less than a week before the expiration of her year's residence at Fredericksburgh: he believes she did not leave Fredericksbg. for 6 or 8 days after the time so fixed for her departure: but is not certain of the precise time she did set out: for for the first two or three days, she staid at the house of said H. O. Middleton complaining of being unwell: she then left his house, and the witness knows not where she spent the residence of her time before she left Fredericksburgh for the District: he understood she was visiting about Fredericksburgh. 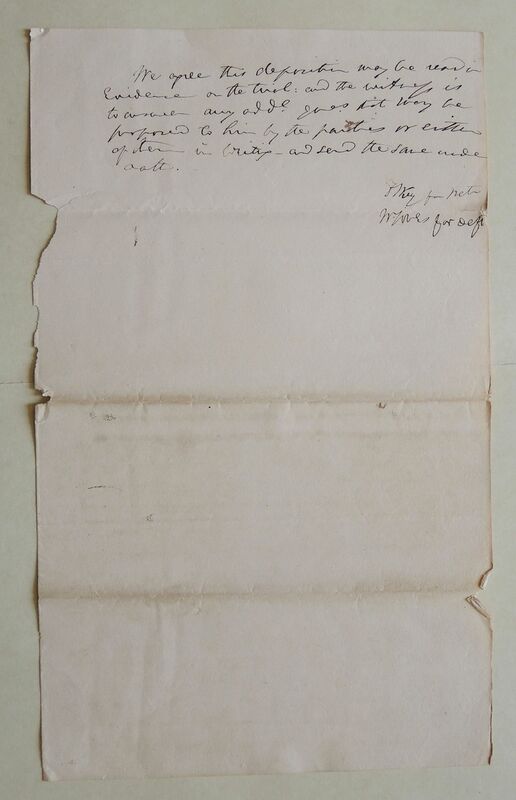 5. in answer to the 5 question he says he knows nothing of the time or place of the sale in question: he was in Virginia at the time the transaction alluded to took place: When said H. O. Middleton gave his directions to the Petitioner to go in the Steam Boat, and fixed the 1st Decr. for her departure as before stated, he himself left Fredericksburgh on a visit to Maryland and the District and left the Petitioner to follow, pursuant to his directions: he returned to Frederickburgh in about three weeks and on his return mentioned in the presence of the witness that he had made an exchange with Mr. Caldwell, giving the Petitioner in exchange for another woman & child whom he brought on with him to Fredericksburg. We agree this deposition may be read in Evidence on the trial: and the witness is to answer any addl. ques. that may be proposed to him by the parties or either of them in writing and send the same under oath.